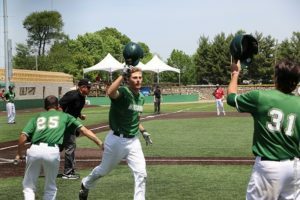 Missouri S&T’s saws their NCAA Division II Midwest Regional run come to an end Monday afternoon, as the Miners lost 10-5 to Southern Indiana in the championship game of the tournament. The loss ends the Miners’ best season in school history with a 39-19 record as S&T – the champion of the Great Lakes Valley Conference’s West Division – reached the regional title game for the first time ever. S&T had won four consecutive elimination games to reach Monday’s championship round, but the pitching staff wore down after playing five games in four days. S&T allowed three runs in the bottom of the 1st, two more in the 4th and then three in the 5th. S&T took a 2-0 lead on a first inning homer by Nick Ulrich and tied the game at 3-3 in the 2nd. That’s as close as the Miners would keep it. Ulrich later homered for his second of the game, breaking the Miners’ single season record for home runs with his 10th of the year. Ulrich became the first Miner to not only reach double figures in home runs for a season and became the first from S&T with a four-hit game during the NCAA Tournament.